TPC Overall Rank: #183 out of 2933 rides. User Tracker Count: 558 times. Great ride. Another good racing coaster. This ride isn't as good as some other racing coasters I've ridden, like Rebel Yell or Kennywood Racer, but it is great because it is higher, faster, and longer than some of the other racing coasters out there. With its unique figure-8 design, this is one of the best racers out there, no doubt. This is an amazing ride! It combines my two favorite things: Adrenaline, and competition! I rode it at least 5 times, but won the race only once or twice. This is the most FUN and the one you MUST do at Cedar Point. You ride side by side. The lines are both short. I rode this ride at least five times in a row just because it is so much fun. The height is 120 feet and it seams ever second is a drop. A must do. Its smooth and easy to put your hands up on. Gemini is very special, it was my first coaster, i love the fact that it races and also gives great airtime! this will always be a favorite coaster of mine! Gemini provided a good mix of tradition in the wooden structure and steel rail providing a smooth ride but tricking you into thinking your on a wooden coaster. The initial slow pace of the lift gave me a chance to look around the park on and check out the water front areas in particular. After riding Millenium Force it was nice to slow the pace a little. With a top speed of around 60 MPH, the way the course was layed out provided a good mix of stomach churning drops especially the first which provided quite good thrills for being only 125 ft and small pops of airtime as well as excitement and anticipation for the whole family. The coaster provided some great head choppers as well. The final helix was crazy and quite intense it was a very nice touch to the coaster. Certainly not to be overlooked for it was a fun coaster unfortunately I didn&#39.t get a chance to ride it racing. Fun. It’s a simple word really, just three little letters strung together. Yet, that simple word can make or break a roller coaster and its experience. We coaster enthusiasts travel the globe wanting to ride the biggest and best, the fastest and wildest, the unique and the quirky. But deep down, at our core, what we really want is a ride that is FUN. It can take a ride or coaster that is nothing out of this world or ground-breaking and elevate it to one that is memorable, and even more than that, reridable. It’s a shame that sometimes you can go on coasters that, for one reason or another, just aren’t fun. Those are the ones that really make you scratch your head: "I thought fun was the whole idea of these things!" I digress somewhat, but my point is that every once in a while, I come across a coaster that embraces the notion of fun so much that it simply boggles my mind! I’m always having fun when I’m at a park and riding, but these coasters I’m talking about take the fun to another level, and no matter how much I ride them I just can’t get enough. 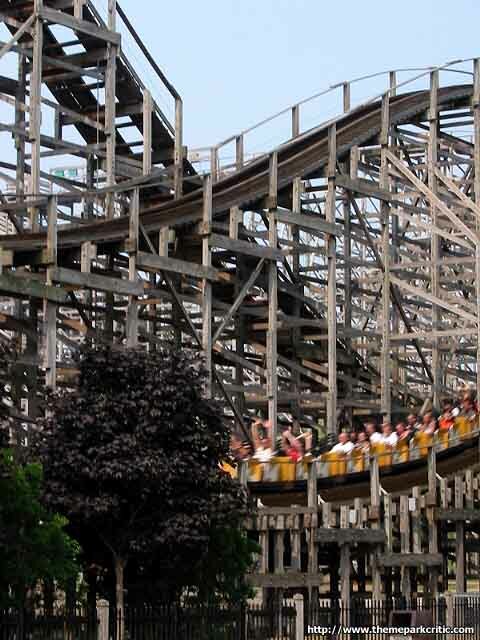 One of the most shining examples of what I’m talking about resides at Cedar Point – Gemini. It’s actually pretty funny that at a park like Cedar Point, where steel monuments plow skyward around almost every turn, this coaster is almost overlooked and written off by some as unimpressive. But, at 125 feet in the air, this coaster is no slouch! 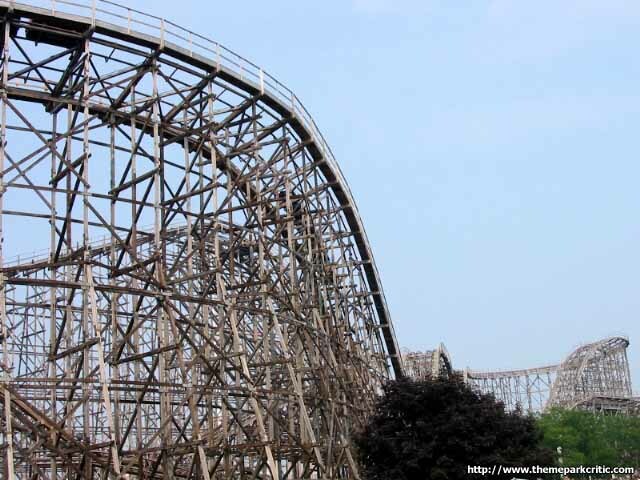 Gemini is an interesting coaster to look at, with its impressive wooden structure that can often sway folks into thinking it is a wooden coaster. However, look closely enough and you will discover steel track running along the course. I like that hybrid look of Gemini, and it has a nice setting along Perimeter Road just before getting to the park’s Frontier area. It kind of reminds me, by its look, of a mine ride on steroids! 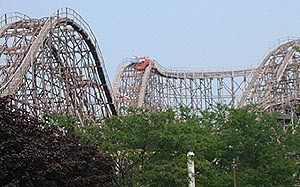 You can find another Gemini in the sky, as a constellation that is often referred to as "Twin", and true to form this Gemini is a twin as well, as it is a racing steel coaster. Racing coasters in general tend to lend themselves to being rides that are a blast to be on, and Gemini is certainly no exception. Amazingly enough, no matter how packed this park gets, I have never waited more than about 15 minutes to climb aboard. That is a glowing testament to the ride’s wonderful crew, which is enthusiastic and remarkably efficient. This coaster at one time ran an unheard of 6 trains, but the crew has been so good that they dropped down to 4 and the line still moves lightning-quick. The trains are decent and comfy, with a lap bar and a single seat belt that goes over both riders. After a pep talk and some trash talk between the red and blue train operators and riders, it’s time to race! Does this thing actually race anymore? Im sure it does, but I always seem to catch it when only one side is operating. Porblem is, I think the whole racing element is what makes it fun. The ride itself is odd, as its basically a gaint mine train. It has some decent pops of air and some great headchoppers. I enjoy it, but its so much better when it races. Gemini was an excellent coaster that I actually liked better than Magnum! The racing element was excellent and it was a close race throughout. Also, all of the drops provided some great air-time, especially the major ones which had incredible ejector air. The ride was pretty long too and like everyone says, its a capacity machine. i remember my first attempt to ride this when i was 9 or 10 years old....i got to the station & started crying like a little chicken & wussed out! i was scared because this coaster did not have otsrs. i thought at the time this coaster with the steel tubular track would have them & i was scared that they didnt have these restraints. but this is a definitly a do not miss ride. it provides some good airtime with a real good first drop. the head chopper gets me every time. nice helix finale too. & the racing aspect always keeps this ride interesting. i also love the ride construction. 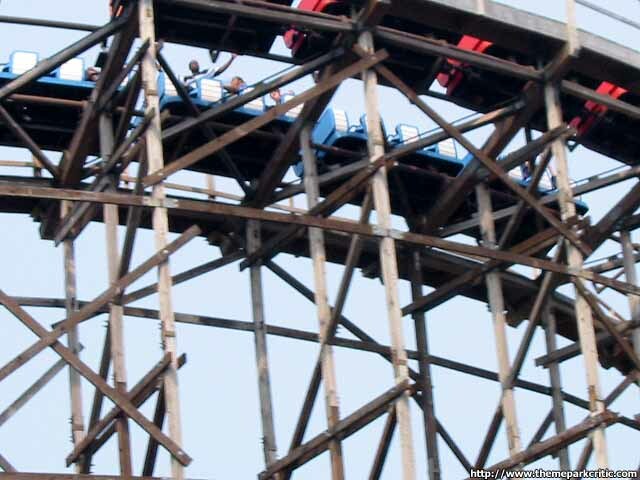 wooden supports with steel track, no coaster comes to mind with this type of construction. at one point it was also the tallest in the world.